Nelson Laboratories opens new analytical chemistry lab, expanding its in-house service offering to include additional analytical instrumentation capabilities like chemical characterization testing of medical devices, qualitative and quantitative analysis of metals, qualitative and quantitative analysis of volatile, semi-volatile, and non-volatile organic compounds, and determination of leachable and extractable compounds. 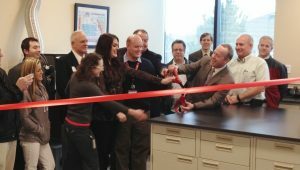 SALT LAKE CITY, UT – February 25, 2015 – Today veteran microbiology lab, Nelson Laboratories (www.nelsonlabs.com), opened a new dedicated analytical chemistry laboratory, in preparation for expanding its in-house service offering to include additional analytical capabilities. This newly renovated space, named Redwood 5, is located across from their main campus, adding an additional 3700 square feet to their already impressive 128,000 square foot facility. Nelson Laboratories has traditionally subcontracted chemical characterization testing, but this expansion will allow them to begin performing nearly all chemical characterization testing on-site, adding to their existing chemistry testing expertise in total organic carbon, FTIR, differential scanning calorimetry, UV/Vis spectroscopy, gravimetric analysis, physicochemical testing, and gas chromatography. Visit PRWeb for the complete release.